Yesterday, October 19th the third and final Presidential debate took place in Las Vegas, Nevada. 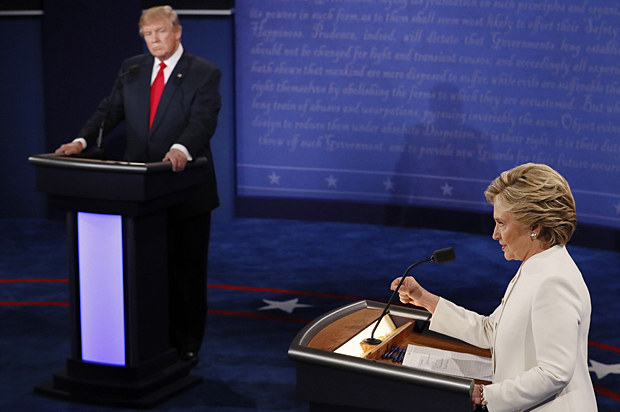 This was the last opportunity Presidential candidates, Donald J. Trump, and Hillary R. Clinton, had to present their positions on various different issues, and make a final attempt to gain the support of undecided voters. The debate has left much to talk about, while many questions still remain unanswered. The moderator of the debate, Chris Wallace, of FOX news questioned the candidates on various different topics ranging from the Supreme Court nomination, economy, foreign policy, and more importantly the candidates’ positions on immigration reform. On the subject of immigration, the moderator introduced his question on immigration by providing an overview of each candidate’s positions on immigration. Wallace discussed the fact that throughout his campaign, Donald Trump has staunchly advocated for mass deportations and the building of a more secure border, which he believes will successfully deter undocumented immigrants, criminals, and terrorists from entering the United States. By contrast, Wallace highlighted the fact that Hillary Clinton has offered no specific plan on how she would secure our southern borders, where there is currently a massive influx of immigrants, specifically unaccompanied children from Central America, seeking refuge in the United States. Wallace reiterated Hillary Clinton’s commitment to offer a comprehensive immigration reform package within the first 100 days she is in office that includes a pathway to citizenship for undocumented immigrants, with proven ties to the United States. Each candidate was asked to discuss why their immigration policy is the best, and why their opponent is wrong. Donald Trump was given the first opportunity to respond. Trump opened the conversation on immigration by taking the position that providing amnesty for undocumented immigrants would be a ‘disaster’ for various different reasons. First, he stated that it would be unfair for undocumented immigrants to be given a path to citizenship, while immigrants wishing to enter the United States legally, are forced to wait many years to obtain permanent residence. Second, he emphasized that securing our country’s borders is his number one priority. Trump bolstered his claim that strong borders are necessary, by referring to mothers he had met on the campaign trail, whose children were brutally killed by people he claims entered the country illegally. He also stated that for the first time ever he has been endorsed by 16,500 Border Patrol Agents, as well as ICE who share in his belief that our country needs strong borders. Third, Trump claims that strong borders are necessary to deter the thousands of people who are coming into the country illegally, and to prevent drugs from pouring into the United States. Lastly, he stated that the war on drugs is the biggest problem the United States is facing today, thus in his view this presents an even greater obligation to secure our borders. He blamed the Obama administration for its failure to deter illegal immigration, illicit drugs from coming into the United States, and for allowing criminals to enter the United States.